There is new material ready-for-use, created by Sparkfun (thanks Linz!) 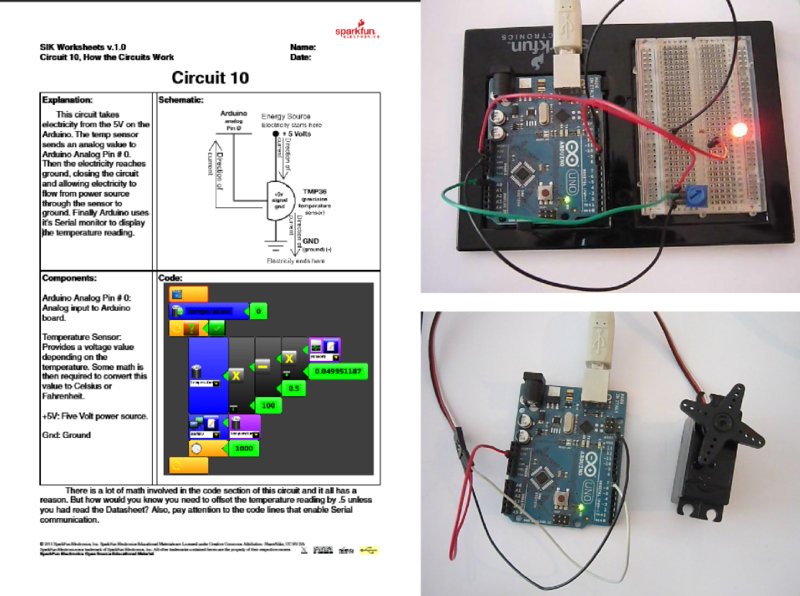 using Minibloq and the Sparkfun Inventor's Kit for Arduino. Currently there are 7 new examples, which include nice printable guides, both in pdf and odt (LibreOffice) file formats, under a Creative Commons Attribution -ShareAlike (CC BY-SA) license. Also, each example includes the Minibloq code (mbqc file). You can download a complete package with all the examples from this link (~ 2 MB). Once you have downloaded and decompressed it, you will find the printable guides under the /Doc subdirectory, on each example's subdir. This is awesome! I've been using the SparkFun Inventors Kit to teach arduino both at our makerspace and at the local high school robotics club. The basic materials are pretty much the same as other ARDx kits (Makershed, AdaFruit, etc) but the packaging makes it nice for reusable kits. Also the SparkFun people have been VERY supportive for our educational outreach efforts. I am very happy to see this cooperation! Thanks for your comment! I'm glad this new material could help to teach robotics and electronics. Thanks Julian! We appreciate all your hard work and dedication to the global educational community. Please let us know when you plan to drop by, we'll make sure you have a good time.